Dubbed by Fire Sense as the “most powerful patio heater on the market,” the 60485 hammer tone bronze outdoor heater boasts an array of impressive features. One of which is that it has a single stage pilotless ignition system which is said to be unique in the industry. But the question is, do these features execute well to deliver their promises? This Fire Sense hammer tone bronze patio heater review (60485) provides you with an answer. In a hurry? Click here to get the Fire Sense 60485 patio heater! – Notable features include the following: wheels for excellent portability and mobility, patented reflector hood made of aluminum, and safety auto shut off tilt valve. – It’s imported from China. – This does NOT run on natural gas (CH4 or methane). It runs only on propane (C3H8). – You need a 20-lb. propane tank, not the mini canisters you’d use for camp stove. – When it comes to ceiling clearance, there are different suggestions as to the supposed distance between the heater and the ceiling. Some say it should be at least one foot, while others say it has to be 5 to 10 feet at least. But ceiling clearance depends on two things — the nature of your ceiling (e.g., wood) and the amount of heat the product gives off depending on the setting. As per Fire Sense‘s instructions, it should be 36 inches above the top for combustibles and 24 inches from the edge of the hood. – How long does a 20-lb. propane tank last? This depends on the temperature setting. As what one consumer said, it will last 2 to 3 hours on high setting and 4 to 5 hours on low. – Is this for indoor use (e.g., garage)? Taking any propane-powered heater indoors is NOT advisable. This is because the by-product of burning propane, which is carbon monoxide, is dangerous to human health. Here’s a summarized list of the Fire Sense 60485‘s pros and cons. – Performance. The heater is less effective below 45 degrees, as per one consumer, and it’s best for temperatures ranging from 40 to 5. – Assembly. There are conflicting comments / experience as far as assembly is concerned. Some say it’s not easy to assemble this outdoor heater, but others say it’s not difficult. One said assembly took 45 minutes. – Mobility. The wheels are a plus, making the unit easy to move. – Ease of use. You turn it on if you want to use it, and turn it off when done — that simple. – Stability. If you live in a windy area, this unit will fall. Instructions suggest that you fill the base with sand. – Design. The finish is quite nice, according to several buyers. The product looks as advertised. Here’s our final word / recommendation / analysis. 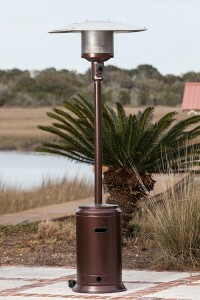 Although the Fire Sense 60485 patio heater is easy to use, easy to move, and have a nice bronze finish, concerns raised on being tipped over especially in windy areas should be considered. 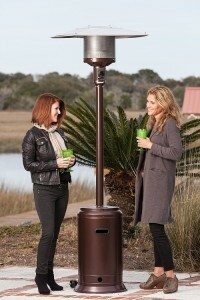 Get the Fire Sense 60485 patio heater here!